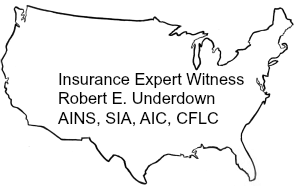 As a licensed life insurance producer and author of articles on life insurance, Mr. Underdown has testified in many cases involving life insurance suitability and standard of care for life insurance producers. The general standards are contained in the NAIC (National Association of Insurance Commissioners) publication Suitability of Sales of Life Insurance and Annuities. Mr. Underdown can perform TOLI Policy Audits and Reviews for your clients, help to prevent lapses of TOLI Policies and provide TOLI Risk Management Services. The most important tool for maintaining a viable trust-owned life insurance policy is the annual policy review. If the trustee is a national bank, under 12 CFR (Code of Federal Regulations) 9.6, the Office of the Comptroller of the Currency mandated that national banks have written documentation of annual reviews of trust assets. A recent survey indicated that 83% of professional trustees (banks, attorneys, accountants and estate planners) have no guidelines or procedures for handling trust-owned life insurance. Furthermore, of the same group, 95% have no policy statement on how to handle life insurance investments. In addition to rules under 12 CFR 9.6, the Uniform Prudent Investor Act (UPIA) requires that trustees act in a fiduciary capacity. Whether a professional trustee or not, there are fiduciary liabilities imposed on all trustees as a result of the UPIA. Trustees are required to maintain an active involvement in the management of the trusts they are overseeing under UPIA. The beneficiaries can hold both professional and non-professional trustees liable for damages if they perform in a substandard manner. The best way to prevent lapsed TOLI policies is to conduct an annual audit and review of the TOLI policies. There are a number of factors affecting the TOLI policy that can change during the year. For example, the rating of the insurance carrier can change. With the upheaval in financial markets, life insurance companies can have their financial ratings change with their exposure to certain financial instruments. The change in financial markets can have an adverse impact on the interest rate the carrier credits to the policy. In addition, the status of the grantors can change. We have seen all too often situations where one grantor has died, and that was not reported to the trustee for appropriate action. The health of grantors can change and make decisions on life insurance options difficult, if not impossible. The risk management of a TOLI policy can have many players: grantors, trustees, attorneys, accountants, financial advisors, family members, and friends. With current laws, there is a clear fiduciary liability for trustees in the administration of the trust-owned life insurance component of an estate plan. Good risk management practices take a pro-active approach to risk; and as such, we recommend an annual review of all TOLI policies. With a properly designed review, the trustee receives documentation from the risk management professional that the fiduciary duties of the trustee are being fulfilled.